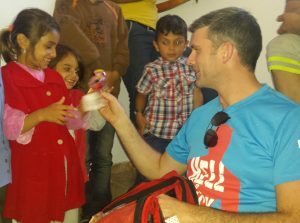 Sligo Garda Ray Wims just returned from the Greek island of Kos, where he and a colleague from Cork, Damien McCarthy went to help Syrian refugees. Here he writes on his experience. HOPE: Joy for a couple of young refugees on Kos as Sligo garda Ray Wims produces some toys he brought from home. Myself and Damien McCarthy (a garda from Cork based in Dublin) decided to travel out to Kos to help refugees as we were moved by the pictures of Aylan Kurdi, the two years-old Syrian boy, whose body was washed up on a beach after a failed attempt to reach Kos. It was only when we arrived that we discovered that deaths like this young boy’s can be a daily occurrence. We were only in Kos six hours when volunteers discovered the body of a 7 month-old baby washed up on the beach in Kos. To date this baby has not been identified. Every night, the people who survive the dangerous boat to Kos are humanity stripped: stripped of their homes, their jobs, their cars, their families, their educations and their hopes and dreams. Many of the refugees told us how they paid €2,500 per person (apart from babies who go free) to smugglers to make the short journey across the Aegean Sea in dangerous dinghies under nightfall (6 to 12 miles depending on the crossing) from Asia to the EU via Kos. Each night that Damien McCarthy and I were in Kos, we, along with a small number of volunteers from Sweden and the Netherlands, were spotting boats, pulling refugees and their children and babies out of the water, feeding, clothing and sheltering the refugees and their families. Our “day” generally started at 1am. Up to 15 dinghies land here every night, containing between 10 to 60 people each, men, women and children, some as young as one week old. The majority of them land in and around the beaches surrounding Kos, where a very small number of volunteers try to ensure that each boat lands safely and people arriving are met with emergency blankets, water, fruit and a change of clothes if required. A group of six volunteers from Sweden work day and night providing clothes, food and water, medical attention, if necessary, and basic accommodation is organised for families with children. The male refugees are provided with a sleeping blanket and tent, if available, to sleep at the port or in a park at the rear of the police station which has become known as the jungle. For the full feature by Garda Wims, pick up a copy of this week’s Sligo Weekender newspaper. In shops now.